In this essay I argue that classical mise-en-scène analysis elides an excess that, when revealed, exposes film’s figuration as a movement of appearing or Erscheinung – a revelation of “otherness” as the very constitution of film in its relation to the viewer. My aim is to undertake an analysis of this figuration in Terrence Malick’s film The Tree of Life, as the shining of the film in its possibilities – in what it reveals of itself as “other” to character and narrative drive. The essay responds to Steven Rybin’s analysis of The Tree of Life, recently published in this journal, which focuses on the acting style of Jessica Chastain who plays the mother in the O’Brien family, a typical mid-twentieth century family living in Waco, Texas. Rybin argues that Chastain’s acting style, and in particular her glances, resist male authority and project her own vision of the world. My analysis shows how the actor’s glances can be seen in terms of a more comprehensive vision enacted by the film which reveals an Erscheinung or revelatory appearance of “otherness” repeatedly shown throughout the film. In Film Art, a key text book in the analysis of classical Hollywood cinema, Bordwell and Thompson propose mise-en-scène as “a term to signify the director’s control over what appears in the film frame [so that] the director stages the event for the camera.” Furthermore, the authors suggest that mise-en-scène is identified by what the viewer recalls after having seen the film: “Of all the techniques of cinema, mise-en-scene is the one with which we are most familiar. After seeing a film, we may not recall the cutting or the camera movement, the dissolves or the offscreen sound, but we will almost surely recall items of mise-en-scene.” Thus, for Bordwell and Thompson, mise-en-scène is not simply “what appears in the film frame,” but a recollection by the viewer of selected items set up by the director as a staged event. We see a similar appeal to a cognizing subject in Robert Kolker’s auteur based discussion of mise-en-scène in American film. In Cinema of Loneliness, Kolker defines mise-en-scène as “the film’s articulation of narrative space.” Following this formulation, the task of analysis is to show how elements of mise-en-scène contribute to this story telling in terms of “narrative thrust.” Everything seen in the mise-en-scène contributes to individual viewer perception which “completes” the film as a coherent story. Even in the case of Orson Welles’s experimental cinema, mise-en-scène is ultimately measured by the cognitive certainties of the audience straining to perceive order in the dislocated and distorted story world of the film: “the Wellesian mise-en-scène creates a space so radically dislocated that it becomes a mental landscape [where] knowable structures and the relations between human figures and those structures are distorted by lighting and camera placement to the point of straining the perception of the audience.” In this formulation, mise-en-scène is something that distorts the “knowable structures” – the cognitive certainties of categorical perception – that keep the viewing subject located in rationalized space and time and allow her to make sense of the story being told. Like Bordwell and Thompson, Kolker presents a classical mise-en-scène defined by the formal requirements of the rational subject embodied in a world of causal events and objects arrayed in logically defined space and time. Both Bordwell and Thompson and Kolker analyze mise-en-scène by reducing the appearance of film to the requirements of a hypothetical viewing subject who perceives things in rational time and space. In this reduction, their analysis elides an excess. This excess is simply the appearing of the film as such – its “thereness” as a mode of possibility. The question I will pose is this: what kind of analysis would enable adequate access to the gestures of this excess, in their refusal to partake of the system of meaning that supports the film’s narrative and the cognitive perception of time and space on which such narrative is based? And in what way might this analysis contribute to an understanding of the event of film itself: to the way a film opens itself to possibilities resistive to the requirements of the rational subject? The question I have posed concerns the way a film appears in a specific sense as a filmic gesture – the appearing of the film as an active mode of self-revelation. To invoke an appearance is to assume that this appearance is an appearance of something, which, in the transcendental-critical philosophy of Kant, is called the “thing in itself.” In Kantian critique, the appearing of an appearance denies access to the thing in itself, so that perception is redirected to categories of thought which fixes it in a static system or schema of object relations. An appearance has only a provisional status in Kantian critique: a “phantom” that gets in the way of the subject’s capacity to see and think clearly according to subjective categories of perception and the principles of reason by which experience is objectified in thought. Clear thinking must overcome the phantasm of appearances in order to stabilise itself in the cognition of rational time and space. To account for this resistive residue in the appearing of the film image we might turn to Vivian Sobchack’s phenomenology of film experience and the concept of “wild meaning” she borrows from Merleau-Ponty. Wild meaning is “the pervasive and as yet undifferentiated significance of existence as it is lived rather than reflected upon”; a “direct experience” of “the primordial language of embodied experience” mediated in the relationship between the viewer and the film. The presence of wild meaning in film experience suggests something of the unaccounted excess inhabiting mise-en-scène in classical-formalist film analysis: “The moving picture, too, perceives and expresses itself wildly, and pervasively, before it articulates its meanings more particularly and systematically as this or that kind of signification.” Wild meaning suggests an unaccounted openness in the relation between the viewer and the film – an openness revealed in the film itself as its resistance to categorical modes of signification. Wild meaning becomes an openness in the appearing of the film itself; a revelation of “otherness” in the non-space of possibility the film necessarily harbours in resistance to narrative space. Wild meaning is the path not taken by the film; the film’s capacity to begin otherwise, against narrative thrust. This “other beginning” opens onto a void of meaning as an absolute possibility, or, in Gilles Deleuze’s terms, “any-space-whatever … , a space of virtual conjunction, grasped as pure locus of the possible.” Yet, in its nothingness, the void of this non-space enables the film to appear as such by resisting the claims of narration and characterization as traits of subjective meaning. In resisting these traits, the film becomes itself. It stages and enacts its own struggle to be. In his recent book on the films of Terrence Malick, Steven Rybin makes the following claim: “Malick’s cinema … articulates character and identity not as known entities outside of the experiential frame of cinema, but as sites of possibility enabled by that very frame.” Shortly I will turn to Rybin’s discussion of Malick’s film, The Tree of Life (2011), and look more carefully at how his (Rybin’s) approach relates to my own. However, at this point, I want to pick up on the idea presented by Rybin that the frame of cinema offers “sites of possibility” as an immanence within the frame itself – an opening “otherwise” of the film’s self-unfolding. In this case, the appearing of mise-en-scène becomes an Erscheinung: a revelation of the film’s very possibility; where the film prefigures itself by drawing from the “void” of filmic material – its phantasmic excess operating as an aide mèmoire of the mythic claim of life and death over character and identity. In German Idealist philosophy Schein refers to the semblance of something, a false appearance that leads us astray from the essence of things. But Schein also has a more affirmative connotation in Hegel’s philosophy as Erscheinung (noun) and erscheinen (verb). Unlike Schein (appearance), erscheinen (the appearing of appearance) opens the possibility of a world-beyond as the affirmation of meaning and the truth of experience. Thus any-space-whatever can be understood as the shining void of possibility: the Erscheinung that announces the “to come” of another world already opening up within this world presented by the film as such. The Erscheinung of a film is the “something more” that it offers of itself; the way it carries its “essence” as a material-ideational becoming of the very possibility of worldhood, both “in” the film and beyond. In this article I will refer to filmic excess as Erscheinung: the prefiguring of what the film will be, by the very materiality of the film’s active appearing. William Routt suggests that we undertake figural analysis in terms of the “complex bundles of sense” that appear in the figurative economy of the film, including characters not as individual agents of narrative action, but as bearers of a prefigurement that needs to be fulfilled: “the figure’s fulfilment ultimately dictates all of its prior existence. The figure is constructed by its unknown future, not motivated by its past.” Figures “foretell” the future by the very fact of what they are, in the acts that they do and in the gestures that they make. From this perspective, films have to be read as allegories of their own futurity: they present a foretelling of what “will have happened” by virtue of the very figurations that take place at the figurative level of the film. All films can be read in this way. Some films, however, signal their allegorical status in more obvious ways than others. In so doing they provide ready access to the figurative economy of film as well as to the exposed level of filmic material as a technical praxis, carried forward and expressed in each film in its own singular way. Malick’s The Tree of Life is pre-eminently an allegorical expression of its own possibility, opening up “sites of possibility” as erscheinen: a persistent appearing of a “beyond” within and across the mise-en-scène. My aim is to show how figural analysis can account for the presence of this “beyond” as a resistive gesture within the mise-en-scène, inhabiting the acting style of the actors as well as the framing of the film as it unfolds on the screen. This resistive gesture collapses narrative space and thrust into a void of possibility through which the film shines forth (Erscheinung), carrying the viewer with it in affirming life and human being in a renewed connectivity with all things. Rybin calls these resistive gestures an expression of “inner life and existential direction.” However, I want to suggest that we think of these gestures in another way, not as an inner life and existential direction (which presupposes subjective motivation and psychic affectivity outside the frame of the film), but as an emptying of any “innerness” that might be designated to the character, as a struggle not to be. That is, the resistive gesture does not reflect back on the inner life of the character presumed to exist in some extra-filmic domain beyond what appears on the screen, but as a gesture “otherwise” within the frame of the film itself. This means that what the gesture resists is the very character it inhabits. 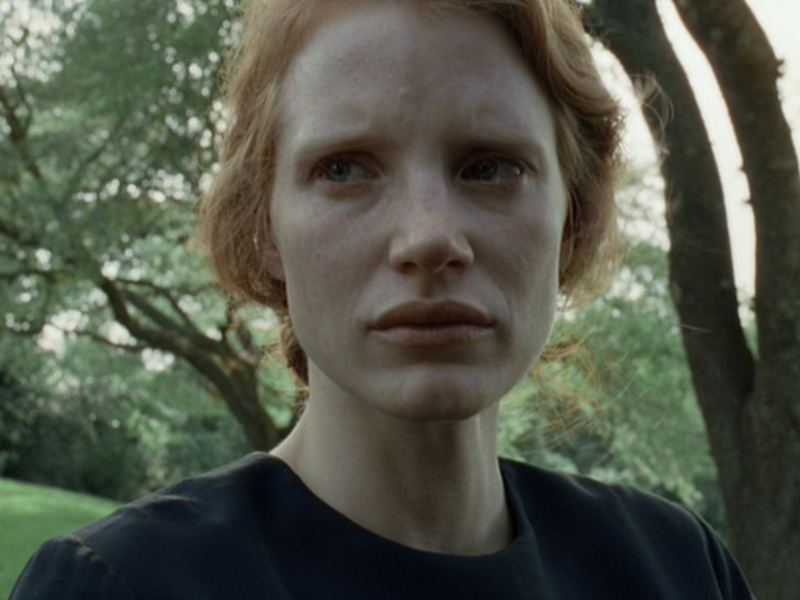 In terms of Chastain’s characterization of the mother in The Tree of Life, what her glances resist is not the authority of her husband as one character to another; rather, they resist her own submissiveness to the position assigned to her by the patriarchal authority enacted in the dinner scene. Chastain is engaged in the difficult task of unwilling her own subjugated will, to free herself from the “being” already assigned to her as a mother in a typical mid-twentieth century nuclear family. In order to explain more fully why the mother must “unwill” her subjugated will, we need to take a step back to gain a broader view of what the film presents as a whole. the film enacts the coming into being of self-consciousness, which affirms the will-to-power as a possibility of life. From this point on, life will become progressively willful and violent, as the realization of self-consciousness requires the withholding of “power-over” as a means of controlling others. 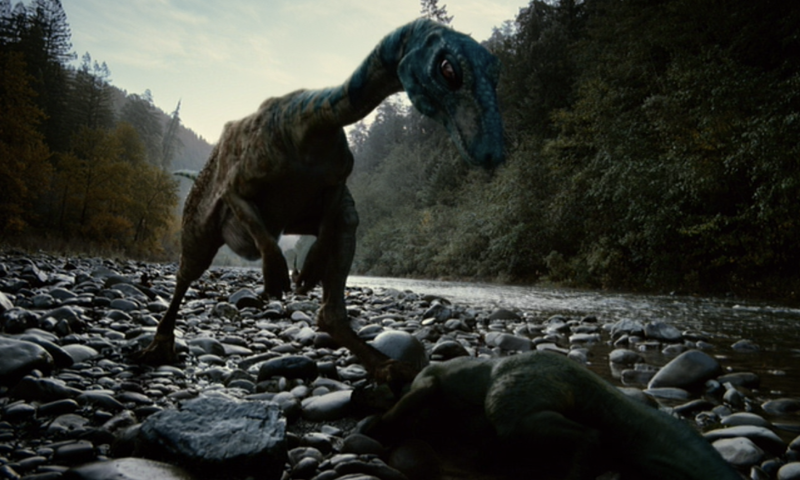 The dinosaur scene places the Fall (which in Christian doctrine is assigned to humans as the fall from Grace) back further than human being and suggests that power and choice are not specific to humans but part of the evolution of life itself, and entail both life-giving and life-taking impulses. 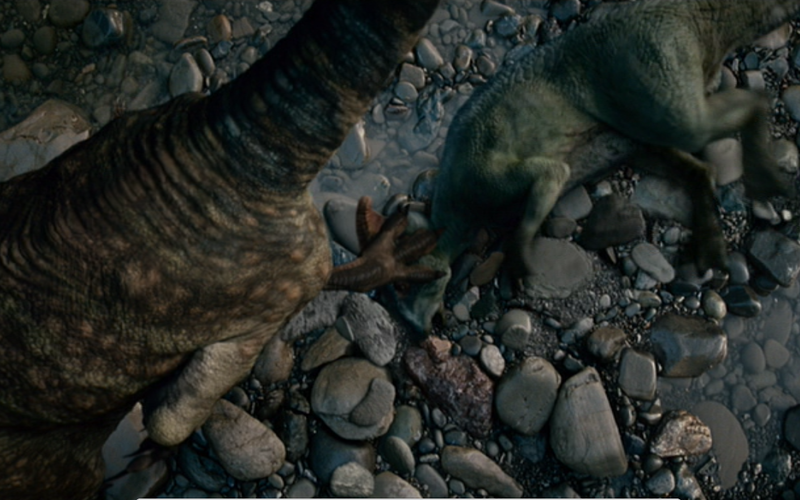 The sparing of life in the dinosaur scene is repeated in a later scene when the eldest son, angered by his father’s harsh admonishments, is tempted to release a jack holding up a car under which his father is working (Figure 3). Like the dinosaur who places his foot on the other dinosaur’s prone body three times before sparing its life, the boy is tempted three times to release the jack. Yet, like the dinosaur, he refuses, thereby sparing his father’s life. This gesture enacts a “possibility of being,” with an awareness of power over others. The boy suddenly grows up with the realization that he can both take and spare the life of others. The film enacts this possibility as the coming of moral self-awareness in ensuing scenes that depict the boy testing his younger brother’s trust. In the adults, this sense of morality has already become guilt ridden religious conscience, as their faith in God and the goodness of life is tested by the death of the younger son which features earlier in the film. From these considerations it becomes clear that Jessica Chastain’s gestures in playing the character of the mother need to be seen in broader terms than subjective vision. Rather, they need to be seen as part of the possibilities enacted by human being as an evolved “way of being” with a specific kind of “will to power.” These possibilities are resistive in the sense that they lead otherwise than the way of being enacted; that is, the mother’s resistive glances are a consequence of having to “live out” a way of being defined by male authority in the nuclear family as the only way of being for humans at that time. The film as a whole enacts this will over others as the affirmation of human being in its present stage of evolution; the stage defined by social-industrialized capitalism and the nuclear family in mid-twentieth century America. The mother’s resistive gestures are thus part of this will to power, and not separated from it. The glance away is not restricted to the mother, but repeated by other characters as they also attempt to unwill their subjugated will to the techne that commands them (as subject to the technological-industrial complex of modern America). For instance, we see the eldest son Jack – now a grown man, working as an architect in the city – constantly glancing aside as he questions his own existence. Jack is seen at work and wandering through the domains of an ultra-modern office building which surrounds him in glass and concrete. Shots from below sweep upward to the glass walls of the canyon of buildings through which Jack wanders, trapping him in a universe of mirrors – a simulacra that reflects his own self back to him. In this simulated world, the natural world has long since lost its independence, and has become incorporated into the simulation itself: trees and grass grow neatly along the verges of the domain which is entirely encased in glass and concrete. At one point Jack runs his hand along the grass verge in a gesture of contact with nature. As futile as this may seem, it nevertheless repeats the resistive gesture that we are now seeing as part of the entire event of the film. We now see that Jack’s glances are a refusal of this ultra-subjective version of self-reflection; they are an attempt to “be otherwise” while still being himself. Jack’s entrapment in the ultra-modernity of the simulacra is an evolutionary extension of the entrapment we have already encountered in the O’Brien family in mid-twentieth century America, where, despite every effort, the father’s business plans fail, and he is eventually demoted in his job. The massively noisy industrialized machinery we see at the father’s work place has been replaced by the liquid silence of post-industrial buildings and environments that define and circumscribe Jack’s life as an architect who works with plans, calculations and aesthetic designs. In this post-industrial environment “the world has gone to the dogs” (we hear Jack mutter to himself), and Jack has come to a dead-end. He is spiritually bereft and his life lacks meaning. Unlike his father who retains faith in the meaning of industrialized America (despite failing to succeed in it), Jack has no faith, and is constantly shown looking aside in blank despair. The trigger for the meditations on Jack’s life is a memory flash of the death of his brother, who died at the age of nineteen in circumstances not revealed in the film. Memory of this death event triggers Jack’s flashback memories of his childhood, but which, as I will show, are really the Death Event that enacts the very possibility of the film and its questioning of human being. 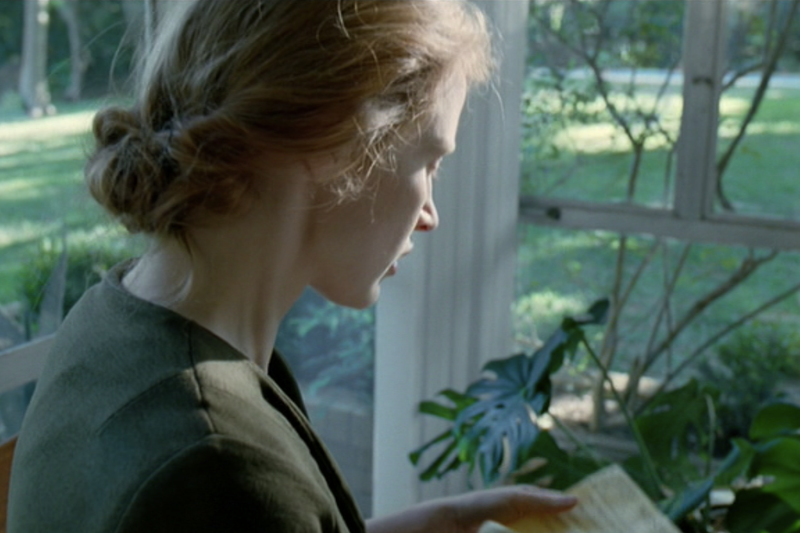 In what follows I will engage in a detailed analysis of one of the early scenes of the film, where Jessica Chastain playing the mother receives a telegram at the front door of her house advising of the death of her son. I will call this the coming of the Death Event. What I mean by this is that the film’s revelations depend on the reverberations of this event as a collapse in being spreading through the entire film and affecting the mise-en-scène with disjuncture and gaping openness. My aim in the following analysis is to describe this collapse through details of the mise-en-scène which is rendered unstable and incapable of sustaining coherent narrative thrust and logically defined narrative space. Through this destabilization, possibilities emerge in response to the questions raised in the characters’ voice-overs as they ponder the meaninglessness of life after the death of the son. My aim is to make three passes through this and associated scenes: the first will consider the emergence of “blank nihilism” appearing on the face of the mother; the second recapitulates the first pass in terms of the chiasmic presentation of the remembering of the Death Event; the third pass shows how the instabilities revealed in the other two passes enact a vision (Erscheinung) of beyond as the film’s answer to the nihilism of the age – a beyond that leads nowhere other than the affirmation of life and human being in the “event” of the film itself. The film’s opening scenes present us with a death. But whose death is it? And when and where does it happen? We are first made aware of this death through the delivery of a telegram to the mother at her neat suburban house in Waco, Texas. We see the mother receive the telegram from the telegram delivery man at the front door. Moving back into the house, she opens the telegram and begins to read. As she does, we are made aware of its dreadful content by her increasingly anguished look (Figure 4). This is accompanied by two jump cuts, which have the effect of showing her to be both “here” and “there” at the same time, as if she had suddenly parted from herself. This “crack” in her being is further accentuated by the simultaneous advancing and retreating of the camera as it follows her through the room producing an anamorphic stretching effect. She appears to be pulled by invisible forces beyond her control, and, in a sudden movement, collapses then briefly rises again while uttering an anguished sob (Figures 5, 6, 7). 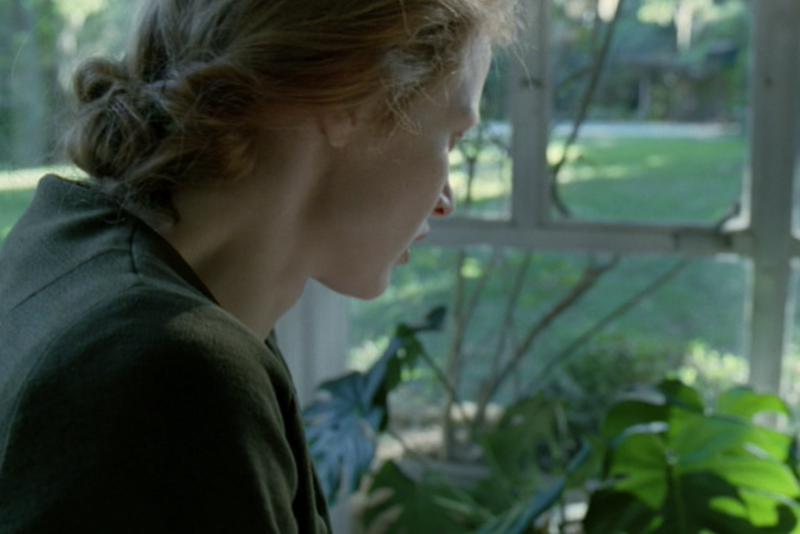 This collapse with its momentary recovery – the consequence of her having received the news of her son’s death – is an effect of the “crack in being” triggered by the jump cuts and anamorphic stretching of the film image. The editing and camera movement cause the actor’s gesture of collapsing and rising, as if the film were itself ontologically bound to the event enacted. The mother’s collapse and anguished sob are interrupted by the film suddenly cutting to the father speaking on a public telephone at an airport, where, we assume, he too is being told of the son’s death. Here, the conversation is drowned out by the roar of an airplane preparing to depart. This massive sound amplifies the mother’s sob from the previous scene, and transfers the pain of her loss onto the father, who walks out onto the tarmac, away from the waiting airplane. At this point the father momentarily falters, bending slightly forward (Figure 8). Regathering himself (Figure 9), he continues to walk forward only to falter again. But this time the gesture is much more pronounced, as he kneels on the tarmac while facing a brilliant red setting sun (Figure 10). These genuflections, which repeat the genuflection of the mother in the previous scene, are accompanied by the sound of a tolling bell – an ominous sign of the family’s fate, but also a “calling forth” of the father as he kneels before the setting sun. In the following scene, the camera roams around the house, lingering in the dead boy’s room and the parents’ bedroom, and follows the mother who comes across the father kneeling at a bench in a private moment of prayer (Figure 11). Unbeknown to him, the mother gazes at her kneeling husband in bewilderment, unable or unwilling to understand or share in his actions, and then turns away in a sideways glance (Figures 12, 13). As noted earlier, Steven Rybin has analyzed Jessica Chastain’s glances in terms of an expression of her personal vision of resistance to male authority. Here we see the glance again, but in this case, the glance seems to be resisting something else: the offering of prayer as an act of submission to the fate dealt to the family. This suggests that the mother is not resisting male authority but what male authority bows down to – here shown in terms of a religious faith in the fate of human being. At this stage, I want to suggest that we read Jessica Chastain’s glance away from her praying husband as a gesture of blank nihilism. The gaze is not at her husband, but through and past him, as an emptying of meaning. In doing this she “unwills” her subordination, not to her husband’s will but to the will that has fated her family to be part of the American project with its faith in the religious-individualist-capitalist enterprise. By glancing aside, she bears witness to the nothing at the heart of human being, a nothing that appears on her almost expressionless face. But from this blankness a possibility emerges as the merest hint of something appearing on her face. This possibility of something more, a beyond what one sees in the nothingness of life, is repeated elsewhere. For instance, a little later, after the funeral when her mother tries to console her with the words “don’t worry, you’ve still got the other two,” referring to her two surviving sons, she glances away with a heavily restrained look of anguish (Figure 14). 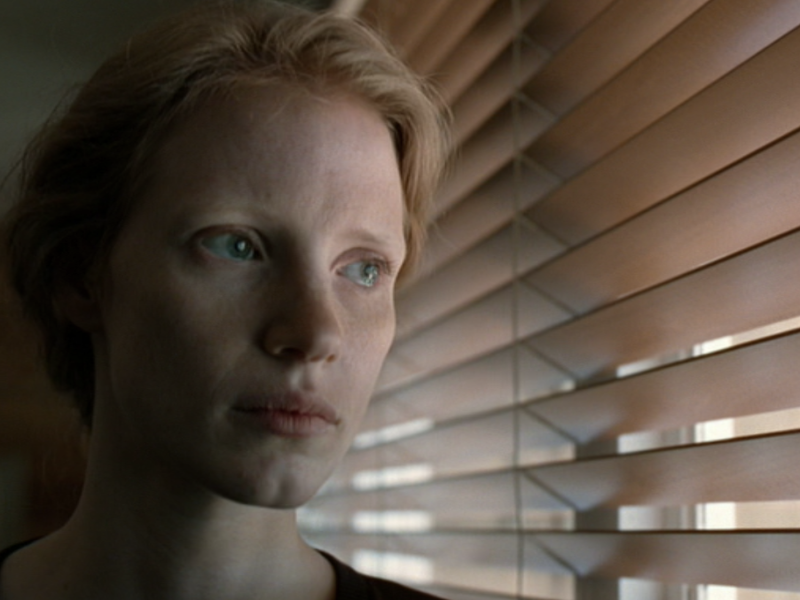 Chastain’s task here is to make this anguish visible on her face, not in its full expression, but as an otherness struggling to make itself appear through the emptiness of what she sees. That is, she is struggling to make this possibility happen against and hence through the “unwilling” of her subjugated will, in the blankness of the nothing to which her face testifies. In this possibility, something is affirmed. In The Tree of Life, there is no sense of temporal continuity; rather temporal sequences are collapsed into a series of memory flashes that may or may not relate to a flashback from one of the characters and may be parallel events running together in at least two different time sequences with no causal connections. The scene following the funeral of the younger son takes us forward to when the eldest son Jack, now a grown man, remembers his childhood and the death of his younger brother. In a sense then, the film could be read as the presentation of Jack’s memory in flashback. However, this does not explain the fact that we only see Jack remembering his childhood after we’ve already seen scenes of the family during this early period of Jack’s life. That is, we are presented with a doubling effect in which Jack’s memories become a product of the film’s revelations and not the other way around. Thus, we cannot anchor the memories to Jack thinking back on his past; rather it is more a case of the film remembering itself in its own self-revelations, triggered by a disjuncture between voice-overs and images presented in the scenes as they unfold. By collapsing the temporal sequence from past to present, the film opens up any-space-whatever as a gaping openness in the mise-en-scène, radically disconnected from temporal causality and open to the otherness of archetypal memory. This means that the mise-en-scène is itself constituted through a collapse of temporality, where events are presented in the future anterior tense (something “will have happened”) in which things that have already happened are seen to be happening for the first time, and in so doing begin to affect things happening now. There is no continuity between past and present, but simply a sequence of possible “nows” strung together and affecting one another. In this case, time ceases to be ruled by causal sequence and opens up in-between the “nows” presented, leading into the otherness of absolute possibility. This in-between of past and present exposes a crack in being – a gaping openness appearing through the film frame as this possibility affirmed. That which is affirmed through the blank nihilism of the mother’s face is carried by the film itself in its collapsing of time and space. How does this occur? If we return to the beginning of the scene with the delivery of the telegram to the O’Brien household, we are confronted with a series of paradoxes. For instance, the man who delivers the telegram appears at the door hatless, wearing a grey zip-up bomber jacket. 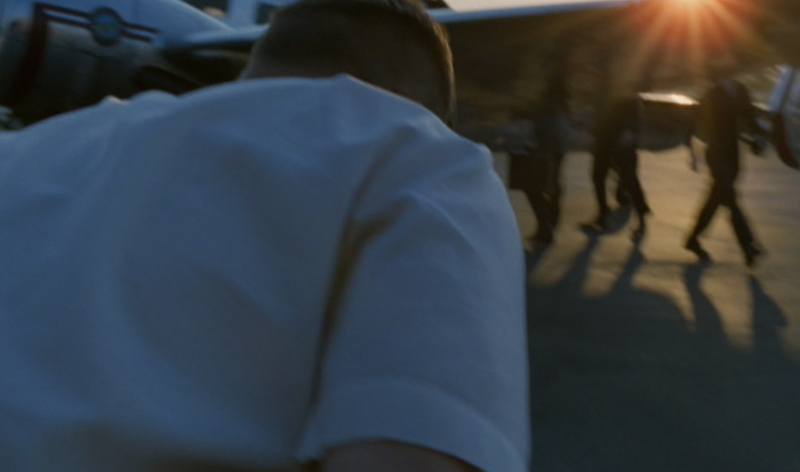 But in the closing shot of the scene the same man is seen leaving the house with a full blue uniform complete with hat. What are we to make of this inconsistency? It indicates a mise-en-scène in which character identity and the temporal sequencing of events are rendered unstable. By substituting a fully uniformed postman at the end of the scene for the more casually dressed postman who delivers the telegram at the beginning, the scene regresses in time; we are taken back to another era, when postmen were more likely to have worn full uniforms. Yet we are never taken out of the present. It’s as if the scene were presenting two different times at the same time. This doubling of time is confirmed in the very next image – a brief shot of the dead son as a young boy playing his guitar. This shot does not linger, but is quickly replaced by a sequence beginning with an image of a spectacular spiralling stained glass church window, followed by fragmentary images of the funeral where we see the mother shaking hands with the priest and later, where she is consoled by friends and neighbours in the front yard of their house. The temporality of this scene is deeply ambiguous. In terms of the film’s story world, this scene occurs when the son is nineteen years old. We learn of this later when the eldest son Jack mentions this fact in a passing comment. However, there is a sense in which we are watching something happening from an earlier period of the family’s life, when the children are much younger. Immediately prior to this scene we have already seen images of the family in earlier times, with the young family sharing breakfast and playing together with their dog in the front yard. However, there is very little in the unfolding of these scenes to indicate an elapse of ten years or so between these early scenes of family life and the delivery of the telegram announcing the death of the son. The film blends these two periods together as if they were part of the same time sequence, and in a first time viewing, it would be difficult not to assume that the death of the son occurs at childhood, perhaps at ten years of age. This doubling of temporality is accentuated by the fact that the mother and father do not appear to have aged. The film doubles on itself, recapitulating the death of the son in different periods of time. This recapitulation is amplified by the doubling of character images throughout the film. For instance, in an early scene the mother as a young girl is hoisted on the shoulder of her father who appears to be played by Brad Pitt, also playing the part of her husband in the scenes to come. The women who console the mother appear to be similar to those in previous and following scenes of the O’Brien household at an earlier stage of their lives. Events are also doubled throughout the film. For instance in a scene that comes after the funeral scene, a boy drowns at a local swimming pool. Although we do not see the boy’s drowning, we nevertheless see the events leading up to it from the perspective of Mr. O’Brien, who dives into the pool in a desperate attempt to save him. This scene is again highly ambiguous as it gives the impression that this is the death of the son whose funeral we have just seen. The event of the drowning of the anonymous boy is an echo of the Death Event working its way through the film. What comes after is recapitulated into the film as affecting what comes before. In this way, death comes not only to the O’Brien family, but to the community as a whole through its entire living history, acting as a constant reminder of the mortality of human existence and the role of chance in the fate of human being. This doubling of characters and events together with the collapsing of temporal sequence produces a chiasm of space-time where later events affect earlier ones, and where identity and gesture are recapitulated through the whole organism of the film as part of a living-filmic being. The chiasm – the crossed temporality of before and after – fractures the mise-en-scène, revealing a gaping beyond shining through it. One of the most perplexing scenes of The Tree of Life is a scene in which we see numerous individuals wandering around on a beach at low tide, in what appears to be a mingling of lost souls. The camera follows Jack who approaches and embraces his mother and father, as well as his dead brother. What are we to make of this scene? I suggest that it presents an extension of the collapsed temporality we have already encountered in the earlier scenes of the telegram and funeral of the son. Each member of the O’Brien family appears exactly as they are in these early scenes, and so we have the slightly unsettling image of Jack, a man well into his forties, being embraced by his much younger mother. This relativising of the characters’ ages to their appearance in the film continues the blending of time of the previous scenes and extends the reverberations of the Death Event into something like a denouement in which hope beyond nihilism is revealed in an after-life where dead souls meet. However, as tempting as it is to read the scene in this way, I want to suggest that this is inadequate, as it betrays the very insight of the film. Rather, the revelation of a “beyond” occurs throughout the film as the gaping openness or shining of that which is constantly revealed as a series of beginnings or “turnings” in the unfolding of the film itself. This shining appears in the very first image of the film, when we see a young girl gazing in wide-eyed wonder out of a window onto nature. This wide-eyed gazing-out is, as Rybin suggests of Jessica Chastain’s gazing in general, “not a way of being looked at, but a way of looking, glancing, and gazing at the world around her, and conveying meaning through this gaze.” The young girl is not simply gazing at nature; rather she is conveying the meaning of her own being through the gaze. Here we see the girl holding a young goat and mingling with cows grazing in the field: a pastoral scene in keeping with a young girl’s sense of being, yet to be tempered by self-reflective alienation from the nature. In the images that immediately follow, this “ontological gazing” of the girl becomes the vision of a young woman in the first flush of marriage and motherhood. As she plays with her young family, we hear her speak in voice-over, posing questions about the rivalling claims of Grace and Nature over human being, suggesting that the film might be read as an acting out of these claims. However, this would be to overlook the very fact of what we see in the film’s unfolding. What she sees is shared with us as the revelation of ontological gazing. Thus the voice-over questions are answered by the revelations of the film itself in its gazing onto nature. The film “speaks back” to the voice-over questioning by its own revelations of nature, repeatedly shown throughout the film as either light streaming down through trees, or as waterfalls plunging into ravines (indicating the primary forces of contraction and expansion of nature). This means that the film is carrying a “beyond” in its self-enactment; a possibility announced in responding to the voice-over questions. This possibility is not an alternative world or transcendent space of reunification of body and soul (suggested for instance by the meeting of dead souls), but the immanence of the ontological gazing enacted by the film in its capacity to bring us (the viewers) and the figures we see on the screen together into a common “being,” signalled in the film’s very first image. This possibility of a “beyond” comes to us progressively through the film as a Bildung or education of human being, presented in terms of a passage from childhood (nature) to adulthood (culture). The film enacts a “fall” from nature into culture where humans are seen to mature into moral beings with a conscience and sense of guilt. Thus, it would be a mistake to assume that the vision of the beyond (Erscheinung) is simply what the young girl sees, as if the film were encouraging a return to a childhood state of innocence. Rather, the film presents this childhood vision retroactively, in line with its chiasmic presentation of the Death Event, as an Erscheinung pervading the entire film, shining through the whole passage of the film, from the opening scene of naïve “seeing” of the young girl, through to the blank nihilism of the adults in the fallen world of conscience and guilt. In its self-presentation, the film constantly shines with the “beyond,” retroactively revealed as a possibility enacted in each scene as that which has always been there for those who are able to see. Although the film begins with the seeing of the young girl, it is not her development that we see. Rather, the Bildung is focused on the education of her two eldest sons into moral beings, both through training in what it takes to be a man by their father, as well as through their own attempts to become moral beings through trials of trust. As the bearer of the initial vision, the female principle is sidelined, and the masculine principle advanced. This is entirely in keeping with the film’s sense of history, in which male interests are seen to prevail over female interests in the “will to power” that characterizes mid-century families in social-industrialized American capitalism. The feminine vision is possible but not yet. Indeed, the feminine is blocked from coming about by the active will of the male. In the dinner scene analysed by Rybin, we see this blocking take place when the father constrains the mother in her attempts to defy his will, by wrapping his arms around her in a smothering embrace. Quite literally, she cannot be the person she could be, but must conform to his authority, his will. This is not simply a conflict between two characters caught in a domestic quarrel, but the struggle for power enacted in the nuclear family of mid-twentieth century America. It is not a case of the actor presenting her own vision of the world, but an enactment of a possibility presented by the film itself. The failure of the masculine will (seen in the later scenes where the eldest son Jack appears to have lost faith in life), is part of the overall possibilities enacted by the vision of the film as a whole. This vision is not the naïve way of seeing of the girl with which the film begins, but a vision that sees through the blank nihilism already blocking human being from seeing and being otherwise (in a moment of regret the father realizes this as his big mistake in life and says in voice-over “I dishonoured it all and didn’t notice the glory”). At the end of the film, the feminine principle re-appears in the form of an anonymous female figure leading the male out of despair and into the light. In sharing her vision, we are partaking of the “not yet” of a feminine vision, as both her seeing and our seeing of her seeing, as a possibility of seeing together in the Erscheinung that the film is. In this article I have argued that classical mise-en-scène analysis elides the appearance of film: its appearing as film; as an excess that shines forth in the possibilities that it enacts. By accessing this excess, we open a resistive space of “otherness” – an “any-space-whatever” in and through which figuration takes place, working itself out across the surface of the film. This figuration can be traced through the gestures enacted in the mise-en-scène by the actors as well as those of the camera and editing, which together produce and exceed both character and narrative thrust. Figural analysis follows these gestures as prefigurements of what will come, recapitulating into the whole film as the “event” of film itself. 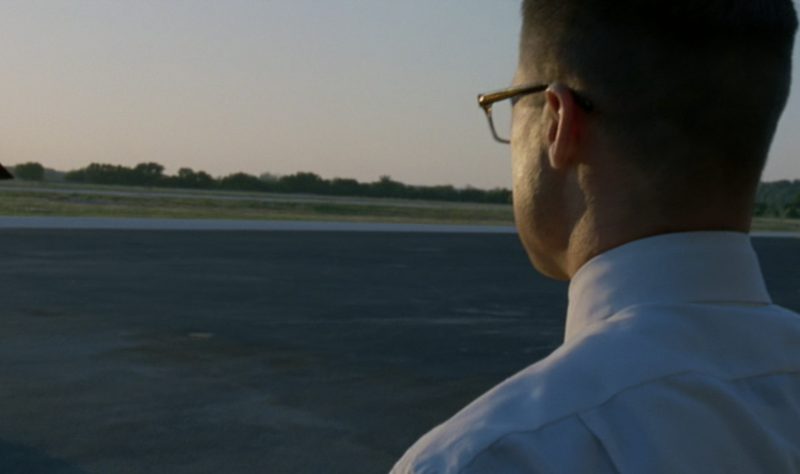 In Terrence Malick’s film The Tree of Life we see this figuration enacted as a series of resistive gestures that open the film to a possible beyond. The beyond is seen and experienced not as some other space outside the frame of the film, but as an enactment by the film frame itself seen “otherwise” in its possibilities resistive to “what is.” The Tree of Life allegorises these possibilities in terms of the “fall” of humans into moral being as a Bildung, where specific human beings (an insignificant family in mid-twentieth century America) is challenged to “be itself” by the sudden appearance of a Death Event that throws them into uncertainty, triggering ontological questioning of their lives and the very existence of human being in the scheme of things. The film partakes of this questioning through its own self-revealing as Erscheinung: the bearing of the openness of being within its own format; its own capacity to carry us with it. We access this capacity by refusing to see the film’s mise-en-scène in terms of the actors’ or characters’ subjective vision or the cognitive capacity of the viewer, and rather allow the film to guide us into its own vision: its own appearing (erscheinen) that reveals a figuration leading “otherwise” as a possibility of human being insofar as we partake of what the film shows as also part of our own possibilities. Warwick Mules is a research fellow in the School of English, Media Studies and Art History, University of Queensland. He is the author of With Nature: Nature Philosophy as Poetics through Schelling, Heidegger, Benjamin and Nancy (forthcoming), as well as co-author of Introducing Cultural and Media Studies: a Semiotic Approach (2002). He is founding editor of Transformations and has written numerous articles on film, art, media and cultural studies. David Bordwell and Kristin Thompson, Film Art: An Introduction. International Edition, 2nd. ed. (New York: McGraw Hill Book Company, 2010), 119. Bordwell and Thompson, Film Art, 135. Robert Stam, New Vocabularies in Film Semiotics: Structuralism, Post-Structuralism and Beyond (London: Routledge, 1992), 189. For Bordwell and Thompson’s theory as cognitive-formalist, see David Bordwell, “Cognition and Comprehension: Viewing and Forgetting in Mildred Pierce,” in Film Theory and Criticism: Introductory Readings, 7th. ed., ed. Leo Braudy and Marshall Cohen (New York: Oxford University Press, 2009), 427-428. In its appeal to a formalised system of elements cognitively known by a viewing subject, Bordwell and Thompson’s cognitive-formalist film theory is a variant of Kantian transcendental analysis. Robert Kolker, A Cinema of Loneliness: Penn, Kubrick, Scorsese, Spielberg, Altman. 2nd. ed. (New York: Oxford University Press, 1988), 22. Immanuel Kant, Critique of Pure Reason, trans. Norman Kemp Smith (London: Macmillan Education Ltd., 1929), 286. Vivian Sobchack, The Address of the Eye: A Phenomenology of Film Experience (Princeton: Princeton University Press, 1992), 11. Gilles Deleuze, Cinema 1: The Movement Image, trans. Hugh Tomlinson and Barbara Habberjam (London: The Athlone Press, 1986), 109. In his essay “The Third Meaning,” Roland Barthes defines this non-space (the void of film), as signifiance, which is “the founding act of the filmic itself.” (Roland Barthes, “The Third Meaning,” in Image, Music Text, ed. and trans. Stephen Heath (London: Flamingo, 1977), 65. Steven Rybin, Terrence Malick and the Thought of Film (Lanham: Lexington Books, 2012), xii. For Schein as false appearance in German Idealism see Michael Rosen, On Voluntary Servitude: False Consciousness and the Theory of Ideology (Cambridge: Polity Press, 1996), 164-166. G.W.F. Hegel, Phenomenology of Spirit, trans. A. V. Miller (Oxford: Oxford University Press, 1977), 89. For the distinction between Schein and Erscheinung, see “Appearance, Illusion and Shining,” in A Hegel Dictionary, ed. Michael Inwood (Blackwell Publishing). Blackwell Reference Online. 28 April 2013 <http://www.blackwellreference.com.ezproxy.library.uq.edu.au/subscriber/tocnode.html?id=g9780631175339_chunk_g97806311753395_ss1-7. For allegory as figurative “lifedeath” foretelling, see Walter Benjamin, The Origin of German Tragic Drama, trans. John Osborne (London: Verso, 1998), 166. 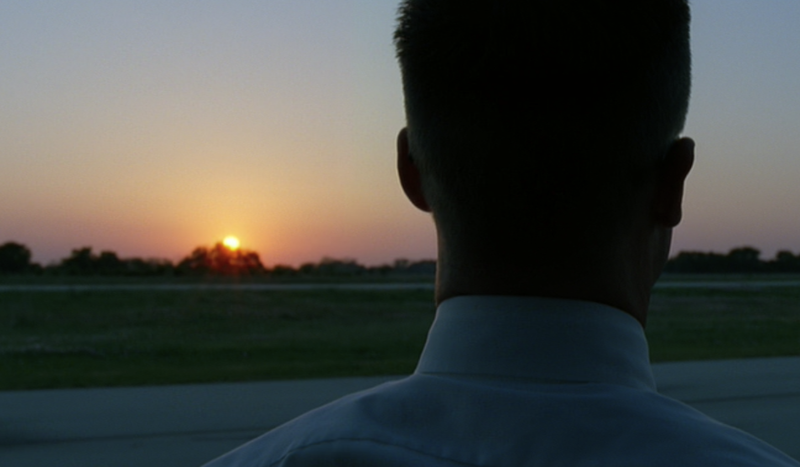 Rybin, Terrence Malick and the Thought of Film, xii. The book was released prior to the public screening of the film. Similar glances can be seen in Nicholas Ray’s film Bigger than Life (1956), which also features a dinner scene where the father explodes with rage over a perceived slight by another member of the family. This scene, occurring in a rainforest river bed, is similar to a scene in Malick’s The Thin Red Line (1998), where, during the Second World War battle of Guadalcanal, a lone American soldier is confronted by a threatening Japanese platoon. The “in-between” of rivers and river beds as a place of danger as well as possibility also features in Malick’s Badlands (1973) and Days of Heaven (1978). There are in fact three sons. The youngest does not figure in these tests. Reference to the younger son in this essay refers to the younger of the two elder sons. Techne refers to the way of being required of subjects within technologically ordered worlds. A techne sets up and asks that a subject be this way or that way, depending on the requirements for reproduction of the technology itself. See Martin Heidegger, “The Question Concerning Technology,” in The Question Concerning Technology and Other Essays, trans. William Lovett (New York: Harper and Row, 1977), 2-35. See especially the section on Enframing (Ge-stell) (20-21). 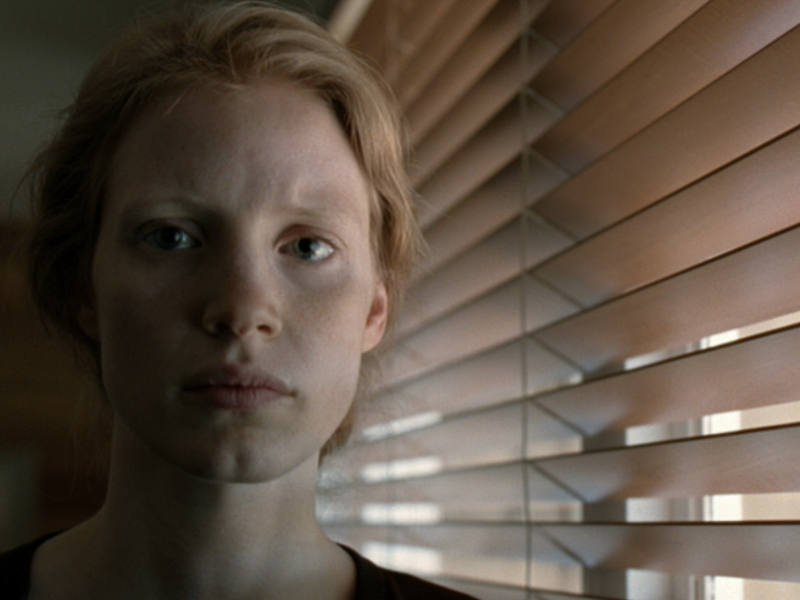 Bersani and Dutoit have noted “the nihilism of the face” in Malick’s films. See Leo Bersani and Ulysse Dutoit, Forms of Being: Cinema, Aesthetics, Subjectivity (London: BFI, 2004), 143. In later scenes we see the father engage in business deals with other parishioners after church services; as a trained musician he plays the church organ. Not only is he a prominent member of the church, but someone who has integrated church activities into his business life as well the pursuit of artistic excellence. See Sam Bass Warner, The Private City: Philadelphia in Three Periods of its Growth, 2nd. ed. (Philadelphia: University of Pennsylvania Press, 1987), for the connection between individualism, economic progress and religion in the growth of American cities as a matter of “men’s private economic activities” (4). I am thankful to Marcus Breen for pointing this reference out to me. To bear witness is to be part of the event that one witnesses by not being part of it; to be able to bear what one witnesses away as a truth to be believed at some other time. See Jacques Derrida’s discussion of bearing witness in Jacques Derrida, Sovereignties in Question: The Poetics of Paul Celan, ed. Thomas Dutoit and Outi Pasanen (New York: Fordham University Press, 2005). For a discussion of chiasm as the collapse of memory in film see Warwick Mules, “The Future at Odds with the Past: Journey through the Ruins of Memory in Alkinos Tsilimodos’ Tom White,” in Millennial Cinema: Memory in Global Film, ed. Amresh Sinha and Terence Mc Sweeney (London: Wallflower, 2011), 139-155. For recapitulation and organicism see Iain Hamilton Grant, Philosophies of Nature After Schelling (London: Continuum, 2006). These turnings are heralded by a rotating fluted image appearing before each beginning. This Bildung could be understood in terms of Schiller’s distinction between naïve and sentimental poetry as distinct aestheticized states of being human. The initial naïve way of seeing of the girl with nature is replaced by a sentimentalized way of seeing that seeks out nature as Idea. See Friedrich von Schiller, Naïve and Sentimental Poetry and On the Sublime: Two Essays, trans. Julias A. Elias (New York: Frederick Ungar Publishing Co., 1966).